The month of February continued to build the kind of momentum of what has the ingredients to be a very successful year in 2017 for the sport of Boxing. As successful as this year appears to shaping up to be however, it has not been without it's share of setbacks. The month of February saw two such setbacks. The most notable one might argue was the scheduled February 25th encounter between former multi-division world champion Miguel Cotto and Jr. Middleweight contender James Kirkland, a bout that was to have been the main event of an HBO Pay-Per-View card was cancelled due to an injury suffered by Kirkland while in training for the bout. What is somewhat ironic was the Cotto-Kirkland pay-per-view card was to have gone head to head with a Premier Boxing Champions card here in the United States televised by Fox headlined by undefeated WBC Heavyweight world champion Deontay Wilder’s scheduled title defense against Andrzej Wawrzyk of Poland. The scheduled Wilder-Wawrzyk fight however, would also not come to fruition as it was revealed at the end of January that Wawrzyk had tested positive for the banned substance Stanozolol in random testing conducted the Voluntary Anti-Dopping Agency (VADA).This led to Wilder seeking a substitute opponent for the second consecutive fight. Before discussing more about Deontay Wilder's opposition for his scheduled February 25th title defense, the circumstances which led to the encounter, the fight itself, and where both fighters stand coming out of the bout, there were other notable events during the month of February featuring a good mix of former world champions, rising prospects, and longtime contenders that warrants attention. Events such as the February 2nd Welterweight encounter between highly touted prospect Sammy Vasquez and former WBA Welterweight world champion Luis Collazo in a bout that headlined a card televised by Fox Sports 1 in the United States as part of the Premier Boxing Champions series. Vasquez, who was looking to rebound from his first career defeat to fellow rising prospect Felix Diaz in July of last year faced the most experienced opponent of his career in the form of former world champion Luis Collazo, who himself was looking to rebound from a failed attempt to regain the WBA Welterweight world championship against current undefeated world champion Keith Thurman in July of last year. Collazo was stopped in seven rounds by Thurman and one may well have thought that he would be an ideal opponent for a rising prospect such as Vasquez, who was coming off of a hard fought decision loss in his last fight. As he has done throughout his career however, when cast in the role of what could be described as an “Enhancement Opponent “ to coin a pro wrestling term, the thirty-five year old Collazo had other plans. Collazo used effective counter punching, timing, and elusiveness to score two knockdowns of Vasquez. The first coming in round three as a result of a counter left, right combination when Vasquez had Collazo against the ropes and the second coming in round six. The second of the two knockdowns, a devastating counter right hand to the head knocked the thirty year old Vasquez out cold. Although he is not known as a devastating power puncher, Collazo’s knockout of Vasquez was certainly the type that turns heads and generates buzz. A clear statement making performance and knockout victory, which will no doubt keep Collazo in the discussion of top Welterweight contenders going forward. As for Sammy Vasquez, this second consecutive loss and more specifically the brutal manner in which this latest loss occurred will likely require some time to recover from. Even though some might be tempted to say that Vasquez is no longer a prospect following back to back losses, it is important to remember that the 147lb. Welterweight division has long been one of Boxing’s most deep and competitive divisions and with few exceptions, one might be hard pressed to find a fighter at or near the top of the division who has not experienced a few bumps in the road throughout the course of their careers. Luis Collazo is one of the best examples of a fighter that has experienced hardship, struggle, and adversity throughout his career. Despite that adversity, Collazo has also shown that perseverance does pay off and he remains a player in a talent-stacked division. If after a period of time to recover from two hard losses Sammy Vasquez can persevere, his career just might be the next great story that Boxing thrives off of. Prospects who also saw action during the course of February included undefeated Light-Heavyweight Mike Lee who improved to 19-0 on February 16th with an eight round majority decision over fellow prospect Justin Thomas in a main event of a card in Costa Mesa, CA that was broadcast worldwide on the Fite TV app. In what was a close and tactical fight Lee was simply the more active and slightly more effective fighter, which allowed him to get the nod on the official scorecards. Although a majority decision may be viewed by some to be too close for comfort for an unbeaten prospect who is looking to advance to the next level in their career, fights like the encounter between Lee and Thomas are vital in terms of a fighter’s development and gaining valuable experience that can only help a prospect as they progress. For Lee, who was rated number twelve in the world in the World Boxing Organization ‘s (WBO) Light-Heavyweight ratings going into the fight with Thomas would appear to be approaching a point where he could potentially face a fighter rated in the top ten before the end of 2017. The question in my mind will be who Lee decides to fight next, which may determine how quickly he faces someone in the top ten. The Light-Heavyweight division also saw a bout to determine a new mandatory challenger for long-reigning WBC world champion Adonis Stevenson as current number one WBC Light-Heavyweight contender for Eleider Alvarez met former IBF Super-Middleweight world champion Lucian Bute on February 24th at the Videotron Centre in Quebec City, Canada in a bout televised on pay-per-view. This was an interesting fight between a longtime top contender in Alvarez, who had seemingly been in line for a world championship fight for the last couple of years against the former longtime champion Bute, who after dropping a hard fought decision to current IBF Super-Middleweight world champion James DeGale and earning what some felt was a controversial draw against WBC champion Badou Jack in his previous two fights, was now looking to bounce back in the Light-Heavyweight division after previously dropping a decision to former WBC Light-Heavyweight world champion Jean Pascal in January 2014 in a bout that was for the North American Boxing Federation (NABF) Light-Heavyweight championship. Initially, it appeared as though Bute would be too quick for Alvarez as he frequently beat him to the punch early on in the fight working behind a consistent jab, mixing in combinations, and using good lateral movement. Alvarez however, would bring a sudden and dramatic end to the bout when he connected with two flush right hands to the head of the former world champion Bute sending him down to the canvas. Although Bute was able to beat the count, he was unable to continue forcing Referee Marlon Wright to stop the fight giving Alvarez his twenty-second victory in as many fights. With the victory Alvarez remains the number one contender for the WBC Light-Heavyweight world championship and would appear to be on a collision course with Adonis Stevenson for sometime later this year. This brings us back to WBC Heavyweight world champion Deontay Wilder’s recent defense of his crown against unbeaten contender Gerald Washington at the Legacy Arena in the champion’s home state of Birmingham. AL. It goes without saying when a fighter prepares mentality as well as physically for one opponent that a fighter’s preparation and performance can sometimes be affected when the scheduled opponent falls out of the fight regardless of the reason, putting the fighter who chooses to still compete as scheduled in a predicament of facing an opponent on short notice. As stressful as the situation had to of been for Wilder, it is one that he is not unfamiliar. Some may recall in Wilder’s previous title defense against longtime contender Chris Arreola, that it was Arreola who entered the fight as a substitute in due to WBC number one contender Alexander Povetkin himself tested positive for the banned substance meldonium a week before what would have been a mandatory title defense for Wilder in May of last year. Wilder, who stopped Arreola in eight rounds in July of last year suffered torn right biceps and a broken right hand in the bout, which kept him out of action for the remainder of 2016. The champion coming off of two injuries now found himself in a similar scenario as when the scheduled defense against Povetkin was cancelled due to Povetkin’s failed drug test, when Andrzej Wawrzyk found himself in the same position as Povetkin was. In Gerald Washington, Wilder faced an undefeated rising contender who had stopped twelve opponents in his eighteen career victories with a draw coming in his seventeenth pro fight against Heavyweight contender Amir Mansour. What was most interesting about this fight in this observer’s eyes was Washington at 6’6 was nearly level with the champion, who is 6’7. Washington also brought into the fight a seventeen pound weight advantage coming in at 239lbs. over Wilder, who came in at 222lbs. What is always interesting about a fight like this with a fighter facing a substitute opponent, particularly when that fighter is a world champion is not only how the fighter who had to deal with the change of opposition performs, but also how the substitute performs after taking the fight on short notice. Washington came to fight working behind a solid jab and was surprisingly effective in his attempt to work the champion’s body. Wilder looked sluggish for a time throughout perhaps due to the late change in his opponent as Washington took the fight on a little over three weeks notice. After three rounds, the challenger seemed in command due largely to how effective he was in using his jab to control the distance at which the fight was fought that in some was reminded me of how former Heavyweight world champion Larry Holmes executed his jab against opponents. It was in the fifth round where the champion would make the challenger’s performance up to that point an afterthought as Wilder floored Washington with a right hand followed by a left hook to the head that sent Washington down to the canvas. Washington showed his mettle and got up from the knockdown, but he could not defend against Wilder’s follow up barrage forcing Referee Michael Griffin to stop the fight. The way this fight ended was similar to the ending of the Bute-Alvarez encounter from the previous evening. Much as was the case in the Bute-Alvarez fight, Gerald Washington appeared to be in command of his fight as Lucian Bute appeared against Eleider Alvarez. Deontay Wilder however, in a similar fashion as Eleider Alvarez was able to knock Lucian Bute out in sudden fashion with a combination highlighted by a right hand. Although Wilder-Washington was able to go on for a few more seconds after Washington got up from the knockdown and gamely tried to continue the fight, the commonality between the two fights was the sudden and brutal way each met it’s conclusion. For Deontay Wilder, it was his fifth successful title defense of the WBC Heavyweight world championship he won from Bermane Stiverne in January 2015. In an interesting development, it was announced by the World Boxing Council (WBC) earlier this week that Stiverne, who was scheduled to face Alexander Povetkin in an elimination bout in December of last year to determine a mandatory challenger for Wilder did not fight Povetkin, who once again failed a pre-fight drug test, which was revealed on the day the fight was supposed to take place , is now the official mandatory challenger for Wilder and one would assume that a rematch between the two will take place later this year. It should not be overlooked despite some challenges that has come his way both in and out of the ring during the course of his championship reign so far that Deontay Wilder has been a considerably active world champion, despite not facing a mandatory challenger in the little more than two years since he won the title from Stiverne. One can only hope with Stiverne now in position for a rematch against Wilder per the WBC’s number one ranking/mandatory challenger status that Wilder will finally get to fulfill his mandatory obligations as champion by facing the sanctioning organization’s top contender after being prevented from doing so due to circumstances that were out of his control. As for Gerald Washington, he established himself as a player in defeat in what was an impressive showing before he got caught by Deontay Wilder. It would not surprise me based on how well he performed against Wilder to see Washington in with a top contender perhaps later this year. With the book now closed on the month of February, the Boxing world now focuses it’s attention on two intriguing fights that will kick off March in a big way on Saturday. The first of the two bouts will take place at the O2 arena in London England as former two-division world champion David Haye squares off with current WBC Cruiserweight world champion Tony Bellew in a scheduled twelve round Heavyweight bout that will be televised in the United States on AWE. Haye, who began a comeback in January of last year after a near four-year absence will be in for the toughest test in what will be the third fight in his comeback after scoring knockout victories over Mark de Mori and Arnold Gjergjaj in 2016. Haye faces Tony Bellew, the current WBC Cruiserweight world champion who is coming off of an impressive third round knockout of longtime Cruiserweight contender BJ Flores in a title defense last October. This is an encounter between two fighters who have a good mix of speed and punching power that are each capable of getting an opponent out of there should the opportunity present itself. Although one of the main storylines going into this fight is there appearing to be a genuine dislike between the two fighters, for this observer the storyline /question I am interested in as this fight approaches centers on whether two fights against over matched opposition will be enough preparation for Haye to go against a fighter of the caliber of Bellew, even though Bellew is moving up in weight for this fight. Some may feel that the fact that Haye has not fought as a Cruiserweight in over nine years since scoring a knockout of Enzo Maccarinelli to briefly unify three of five world championships in the division before becoming a Heavyweight, that his having more experience as a Heavyweight might give him an advantage over Bellew who will be making his Heavyweight debut. Bellew however, does have power having stopped four of his last five opponents inside the distance. It is also worth noting that Bellew has only been stopped once in his career as a Light-Heavyweight when he challenged WBC Light-Heavyweight world champion Adonis Stevenson in November 2013. Much like Stevenson, Haye has speed and punching power that can come in sudden spurts and gives angles that has proven to be difficult to time for most opponents. Much like Bellew, Haye suffered a knockout loss early in his career in his eleventh pro fight against former two-time Cruiserweight world champion Carl Thompson in a failed attempt to win Thompson’s IBO Cruiserweight world championship in September 2004. The only other loss on Haye’s record came against longtime Heavyweight world champion Wladimir Klitschko in losing a twelve round unanimous decision in July 2011 in what was a unification bout where Haye lost the WBA Heavyweight world championship. Given each fighter’s style and willingness to mix it up regardless of who the opposition might be as well as their dislike for one another, it would surprise me if this were not a fight that saw some action where the possibility exists of an exciting battle. One could make an argument that this is a crossroads fight for both fighters and it will be interesting to see who will come out on top. The second of the two encounters taking place on Saturday will be a battle to unify the WBC and WBA Welterweight world championships as undefeated WBA world champion Keith Thurman faces undefeated WBC world champion Danny Garcia at the Barclays Center in Brooklyn, NY in the main event of a Premier Boxing Champions card televised by CBS here in the United States. This fight has all the ingredients of an all-action fight as both fighters tend to be offense first and have engaged in some notable wars in the past. Thurman comes into this fight off of a grueling battle in the same venue where his fight with Garcia will take place against former IBF Welterweight world champion Shawn Porter in June of last year. The current WBA world champion has scored knockouts in twenty-two of his twenty-seven career wins registering a career knockout percentage of nearly 80%. The question I have as this fight approaches is how each fighter will approach this fight. Both Thurman and Garcia have been more than willing to engage with whomever they’ve faced in the past, both have knockout power in either hand and both are solid counter punchers. If one were looking for a comparable difference between the two, it might be that Garcia, who will enter this fight unbeaten in thirty-three professional fights may be categorized as more of the boxer of the two fighters having scored nineteen knockouts in his thirty-three wins registering a career knockout percentage of 58%. 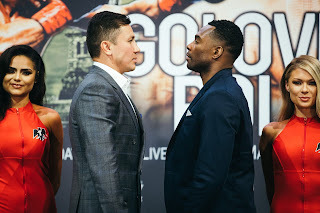 Garcia does have the more experience of the two fighters as he is a two-division world champion having previously held a unified Jr. Welterweight world championship in his career from 2012-2014. The two fighters appear to be equally matched and there is no reason to not assume on paper based on the two fighters styles that this fight could be a candidate for Fight of the Year honors at the end of 2017. What may be the best thing about this fight for Boxing fans beyond two undefeated world champions, each in their prime putting their respective world championships on the line against each other is the fact that this unification bout will be televised on free over the air broadcast television. In an era where the Boxing fan is too often asked to pay what most view as expensive pay-per-view prices to see the best fighters in the sport do battle against one another, sometimes with the fights themselves not living up to the price that fans/consumers are asked to pay to view the battles, this is a nice change of pace. Regardless of who emerges victorious in this fight, it is a change that I hope will not only continue going forward, but also hope that the fight itself will continue the momentum the sport has been building in 2017 so far. If Boxing gets a great fight when Thurman and Garcia do battle on Saturday, regardless of who wins, it will ultimately be a victory for the sport in what should be the start of an exciting March for Boxing.